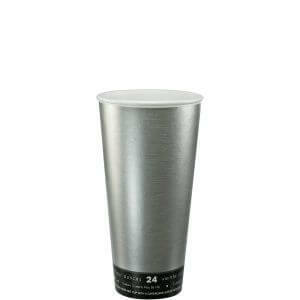 SKU: Dart 24U16FS Fusion Steele 24 oz. 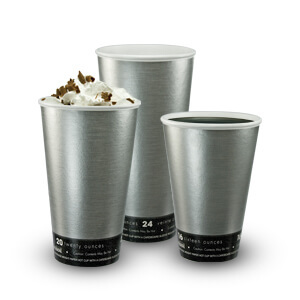 Customizable Foam Hot Cup - 500/Case. Categories: DART, FOAM CUPS / LIDS, FOAM CUPS / LIDS-1. The new Fusion Steele® stock print offers full print coverage with a unique brushed metal design, all surrounded with Fusion ThermoThin core. ThermoThin provides superior insulation, keeping beverages hotter longer while remaining comfortable to the touch. Fusion Steele stock print is available in five sizes with each ounce capacity clearly printed on the cup, making it easy to distinguish between drink sizes. And, four of the five cup sizes accept a single lid size, reducing the need for added inventory.